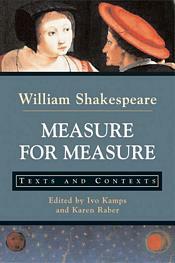 This edition of Shakespeare’s Measure for Measure reprints the Bevington edition of the play accompanied by four sets of thematically arranged primary documents and illustrations designed to facilitate many different approaches to Shakespeare’s play and the early modern culture out of which the play emerges. The texts include royal proclamations, speeches, court records, sermons, biographical writings, prayers, ballads, poetry, excerpts from plays and the Bible, and drawings, woodcuts, and engravings. These documents contextualize the role of rulers and government in Jacobean society, crime and punishment in London’s underworld, the religious and secular laws that regulated marriage and sexuality, Catholic and Puritan morality, and the religious and cultural significance of chastity and virginity in Shakespeare’s time. Editorial features designed to help students read the play in light of the historical documents include an intelligent and engaging general introduction, introductions to each thematic group of documents, thorough headnotes and glosses for the primary documents (presented in modern spelling), and an extensive bibliography.